on plants infected with Xylella fastidiosa. Photo courtesy of University of Ga. CES. The bacterium Xylella fastidiosa is the causal agent of bacterial leaf scorch of blueberry, which primarily affects cultivars of southern highbush blueberries(interspecific hybrids of Vaccinium corymbosum). Recently; however, it has been associated with a decline of rabbiteye blueberries (Vaccinium virgatum) as well. Symptoms on southern highbush blueberries include: marginal scorching of the leaves, premature leaf drop, yellowing of stems and eventual death of the plants. 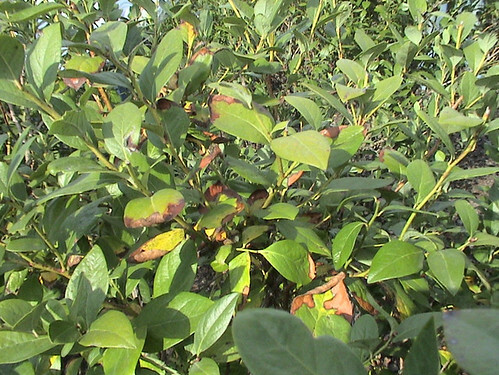 Often, where a plant has died from bacterial leaf scorch, a neighboring plant will show symptoms the following year. Preliminary findings from researchers at the University of Georgia indicate that the strain of X. fastidiosa affecting blueberries is not the same as that causing Pierce's disease of grapes. The bacterium is transmitted by xylem-feeding insects, such as sharpshooters and spittlebugs. Some highbush blueberries cultivars appear to be resistant to or tolerant of bacterial leaf scorch. However, plantings of highly susceptible cultivars are not expected to survive more than 10 years in areas where the disease is prevalent. Cultivar resistance of rabbiteye blueberry to the bacterial leaf scorch of blueberry has not been established. It is essential that new plants not be propagated from Xylella infected plants. At this point, there is no testing program for propagation. However, propagators should never take cuttings from plants which they have not personally inspected for visual disease symptoms. Diseased plants should never be utilized for propagation, whether they have symptoms of Xylella or viruses or other diseases of blueberry. Identification of Xylella-infected plants is possible in the field, and once such plants are identified, they should be flagged and immediately destroyed. By doing this, it is hoped that the epidemic will be slowed. Brannen, Phillip M., Gerard Krewer, Bob Boland, Dan Horton, and C.J. Chang. Bacterial Leaf Scorch of Blueberry. 2008. Retrieved 22 February 2010.